This month, Martha Stewart Omnimedia and Bernhardt Furniture will unveil the latest of the Martha Stewart Signature Furniture lines: Rosebridge. The Art-Deco inspired collection includes 30 pieces of bedroom, dining room and occasional. It also has six pieces of upholstery in 10 new fabric options. Stylistically, the Art Deco and Biedermeier influences mark a new direction for the Signature line. Various wood pieces have walnut and rosewood veneers that flow down drawer fronts in a waterfall effect. Others have a checkerboard pattern of mismatched burl. • A tall dresser whose Art Deco shape gives it a slightly recessed base and top. The drawer faces have swirling burl walnut panels and columns of narrow scoring. • The Bellcourt Sunburst dining table, which features cathedral walnut veneers and a framed walnut burl border. The four-pillar pedestal base has solid wood turned posts and shaped bun feet. It also has a 60-inch top and extends to 84 inches with a single leaf. • The Rosebridge brass console table has a rosewood veneer top and shelf and shaped edges. Its metal base has semicircular stretchers. Some pieces have tumbled brass and heirloom nickel hardware. The Rosebridge joins the other collections in the Signature collection: Lily Pond, Skylands, Turkey Hill, Katonah, Opal Point and this year's North River, which mingles traditional honey-colored finishes and wood turnings with chic mid-century profiles and luxuriously grained mahogany veneers. Gold leaf accents, handpainted chinoiserie, granite tabletops, and bronze-finished grillwork enhance the North River pieces. Bernhardt has decided to release a new Martha Stewart furniture line every six months instead of every year, since the pieces are selling so well. 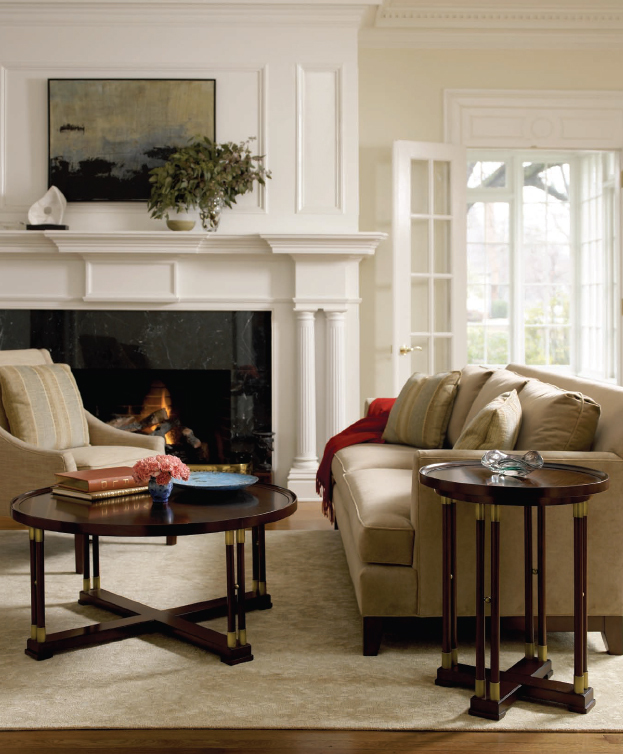 Catalogs for the North River and Rosebridge collections will soon be available for order. I just wondered if anyone has any of the Bernhardt pieces and if so which ones and what's your opinion of it. I have a chair and looking at two other pieces right now.